In line with the Party Wall legislation that was passed in 1996 we can check your liability and correct your building to ensure it complies with the Party Wall etc Act 1996. We act as Party Wall Surveyors for building owners in London affected by works and requiring notice and consent under the Party Wall etc Act 1996. We serve and receive notices. We agree Party Wall Awards and Schedules of Condition. We ensure that the works proceed in accordance with the documentation and that any subsequent damage is rectified by the parties responsible. 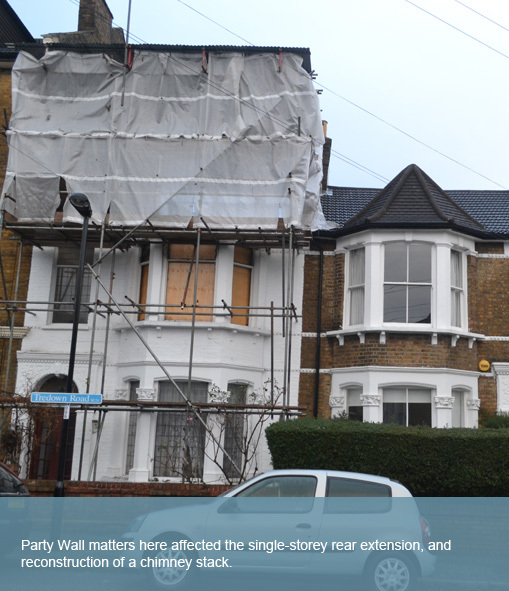 All our Party Wall Surveyors in London are specialists, and work in accordance with the regulations set down by the Faculty of Party Wall Surveyors. Simmons Taylor Hall specialise in Party Wall Matters in London and not only serve Party Wall Notices in London upon behalf of our clients, we also undertake comprehensive Schedule of Condition Reports and legally agree Party Wall Awards in London, which are commonly referred to as Party Wall Agreements.